Blisswood B&B in Cat Spring has a fantastic bed and breakfast offering and stocked lakes with fish just waiting for you to catch and release. Fishing lovers can catch-and-release bass in the ranch's stocked lakes for a fee. Unwind in the peaceful country setting amidst majestic live oaks, open ranch land, and our fully stocked fishing pond. 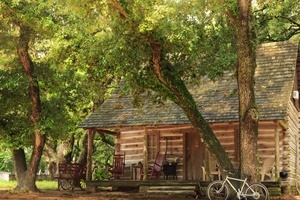 Choose from 16 unique lodging options including turn-of-the-century Texas Homes, The Enchanted Cabin by the Lake or a contemporary Texas ranch house. Enjoy simple life in the calming surroundings of our working ranch, where animals abound including horses, chickens, dogs, cats, pot-bellied pigs, deer, peacocks, and even American Bison. Enjoy numerous ranch activities including horseback riding, archery, animal feeding tours, fishing and more! Our breathtaking 650 acres on the Lehmann Legacy Ranch is ideally located only an hour west of Houston, and 2 hours to San Antonio and Austin. Read about our fun couple days at Blisswood.